These and other strange discoveries about Mercury were announced in seven papers released in the Sept. 30 issue of the journal Science, a trove of knowledge from NASA's Messenger probe, covering everything from odd landscape to the planet's magnetic core. "Messenger is revealing that, contrary to many people's preconceptions, Mercury is a fascinating world with a complex history," study author Patrick Peplowski, a physicist at the Johns Hopkins University Applied Physics Laboratory in Laurel, Md., told SPACE.com. Early in the planet's history, some 3.5 billion to 4 billion years ago, these gigantic volumes of lava poured from cracks in the surface as far as 125 miles (200 kilometers) outside the volcanic zone, flooding the surrounding, low-lying plains "like a bathtub," Head said. Based on the way this lava apparently eroded the underlying surface, the researchers suggest it rushed out rapidly. "We can't say if it took 2.7 days or 15 years or any exact time from orbit, but it wasn't hundreds of millions of years," Head added. Mercury's northern high latitudes had largely escaped view until now. "When we flew by Mercury the first time with Mariner 10, we weren't really sure if volcanism caused these smooth plains," Head told SPACE.com. "Now we're in orbit with Messenger, we're up close and personal, just going around and around and really building up our picture of Mercury." Head and his colleagues expect that other parts of Mercury also experienced volcanism. "This one deposit is so huge, volcanism has got to be important elsewhere," Head said. This Mercury map shows the contiguous northern high-latitude smooth plains mapped by NASA's Messenger spacecraftfrom orbit (inside the black line) covers 4.7 million square kilometers, over 6 percent of the planet. Red circles show the locations of impact craters larger than 20 km in diameter. Planetary scientist David Blewett at Johns Hopkins' Applied Physics Laboratory and his colleagues suspect these hollows were created when volatile materials — perhaps sulfur-bearing compounds — were liberated from the surface through some combination of heating, outgassing, explosive volcanism, micrometeoroid bombardment or solar radiation. This would suggest Mercury is loaded with higher levels of volatile materials than most scenarios of its formation predict. 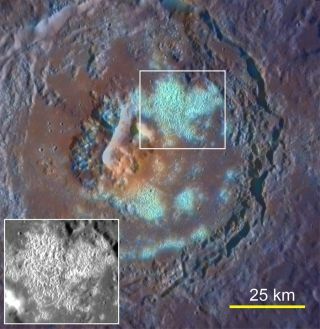 "Analysis of the images and estimates of the rate at which the hollows may be growing leads to the exciting possibility that they are actively forming today," Blewett told SPACE.com. "It is exactly this kind of unexpected discovery that makes planetary exploration such an adventure." This NASA illustration shows how the Messenger spacecraft uses its gamma-ray spectrometer to spot the gamma rays and neutrons, which allows it determine the chemical composition of the planet's surface. The composition of Mercury's surface is substantially different from that of other terrestrial planets, according to Messenger's scans of the X-rays emanating from the planet. For instance, Mercury's surface possesses at least 10 times more sulfur, or brimstone, than Earth or the moon. "These are the first measurements of the composition of the planet Mercury," study author Larry Nittler, a cosmochemist at the Carnegie Institution of Washington, told SPACE.com. Altogether, this surface chemistry suggests the planet formed from material now seen in certain stony chondritic meteorites and cometary dust particles. "It's thought that the terrestrial planets accreted from smaller bodies that were probably similar to or the same as the asteroids that give us chondritic meteorites as well as the dust that makes up comets," Nittler said. "Our work is showing that at some level, Mercury formed from a different mix of these building blocks than did the other terrestrial planets." Measurements of gamma rays emanating from the planet's surface also support theories that Mercury originated from material comparable to that of stony chondritic meteorites. "Our discovery of higher-than-expected volatiles on the surface is one of many results indicating that Mercury has more in common with Venus, Earth and Mars than was expected," Peplowski said. "These findings shed light on planetary formation processes in the early solar system, and by extension tell us about the formation of the other terrestrial planets as well. These results can even be extended to our understanding of extra-solar planets, particularly to large, rocky planets orbiting close to their host stars." These findings also suggest that Mercury did not get as extremely hot as some models of the world's formation have suggested, because extreme heat would have baked out these volatiles. The findings also suggest Mercury's internal heat declined substantially since its formation, consistent with widespread volcanism about 3.8 billion years ago and isolated, limited volcanic activity ever since. "As we continue to collect data from orbit, data from the Messenger Gamma-Ray Spectrometer will be used to measure global abundances of stable elements, like iron, silicon, and oxygen," Peplowski said. "We'll also start mapping the abundances of elements on the surface, which can tell us about regional geologic processes occurring on the surface." Messenger also investigated the magnetic field of Mercury, the only terrestrial planet besides Earth to possess a global magnetic field. These fields come from the dynamos of these planets: electrically conducting fluids flowing in their liquid metallic cores. "It is Earth's magnetosphere that keeps our atmosphere from being stripped away, and that makes it vital to the existence of life on our planet," said study co-author Jim Raines at the University of Michigan. Magnetometer data found that Mercury's magnetic poles are lined up almost exactly with its rotation axis, off by no more than 3 degrees. At the same time, its magnetic equator is north of its geographical equator by about 300 miles (484 kilometers). "The offset implies that the surface field in the north is three to four times stronger near the pole than it is near the southern magnetic pole," study author Brian Anderson, a space physicist at the Johns Hopkins University Applied Physics Laboratory, told SPACE.com. This in turn can affect how space radiation impacts the different hemispheres. The magnetic field of Mercury is much weaker than Earth's. This is likely because Mercury's dynamo comes from just a thin shell of molten metal in its outer core. "Now we have to understand how the circulation of the outer portion of the core, the part that is still molten, can generate a field that is both aligned with the spin axis of the planet and yet be so strongly skewed to the north," Anderson said. "My own hunch is that there are some subtle differences in the history of the dynamo in the north and south and that the thin shell dynamo at Mercury may allow the circulation in the north and south to evolve somewhat differently." This weak magnetosphere also "provides very little protection of the planet from the solar wind," said study author Thomas Zurbuchen at the University of Michigan. Earth's magnetosphere is strong enough to deflect most of the solar wind, but on Mercury, the solar wind apparently sandblasts the surface at the poles, knocking sodium particles off the planet, Zurbuchen and his colleagues said. Those particles become part of the "exosphere," the extraordinarily tenuous layer of molecules that makes up the closest thing Mercury has to an atmosphere. Messenger also found that, unlike Earth and the other planets in the solar system with internal magnetic fields, Mercury is not surrounded by rings of charged particles. (Earth's rings are the Van Allen radiation belts.) Mercury's field is apparently too weak to support them. Instead, the spacecraft detected energetic bursts of electrons lasting from seconds to hours erupting from the planet. "We have seen both proton and electron bursts in our own Earth's magnetosphere, but what really set these observations apart is the time scale and recurrent nature of these electron bursts at Mercury," study author George Ho, a space scientist at Johns Hopkins' Applied Physics Laboratory, told SPACE.com. "On Earth, such bursts happen irregularly and last for minutes, but at Mercury, those events last for few seconds, and we only detected electrons, not protons — still a puzzle to me." On Earth, these bursts are due to the planet's magnetic field interacting with the interplanetary magnetic field. This might be going on at Mercury as well, or the bursts could be the result of Mercury's interaction with the solar wind. Ho said he hopes this data will help theorists better explain the bursts. "All these findings are what exploration is all about," Head noted. "You can say you think you know what a place is like, but then you go there and orbit up close and personal, and you learn what's really going on. You challenge all your knowledge and come up with new ideas."